• Is life feeling difficult and too challenging? • Perhaps you need to take some time for yourself? • You might be struggling with certain thoughts, feelings or behaviour. • Maybe your relationships are suffering? If you want to make sense of your circumstances, counselling can help. My name is Vanessa and I have been a practising integrative counsellor since 2009. I run a therapeutic counselling service in Epsom near Banstead & Ashtead. I can work with any issue and I specialise in baby loss, miscarriage and infertility. I am committed to providing therapy in a safe, warm, accepting, confidential and non-judgemental environment. I have been accredited with the British Association for Counselling and Psychotherapy (BACP) since 2012. To become accredited, members must complete many hours of training, practice and supervision and go through a rigorous application and assessment process. 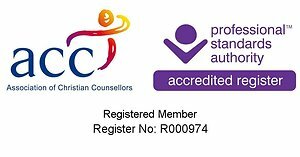 I am a registered counsellor member of the Association of Christian Counsellors (ACC). I am also an accredited member of the Foundation for Infant Loss Training. I offer counselling in Epsom, Surrey with individual adults on an open-ended basis or for an agreed time period, with the aim of enabling you to enhance your life, increase your well-being and to live with a greater sense of freedom. I can also work over telephone and skype. I am experienced in helping clients who have experienced difficulties with: abuse - addictions - anger - anxiety - baby loss - bereavement and loss - cancer - childhood memories - depression - diabetes - disability - disappointment - divorce and separation - eating disorders - fear - guilt - illness - infertility- loneliness - low self esteem - redundancy - relationship issues - stress or unemployment. Whatever your difficulty, counselling can help. A confidential therapeutic counselling service near Banstead & Ashtead. Also available over Skype & telephone. So what does counselling actually involve? I'm a counsellor in Epsom. However I can work with people all over Surrey & the UK using Skype or telephone. We meet for an initial session and then you decide if you would like further sessions. It is important you feel comfortable with me, as it is widely understood that it is the relationship between client and counsellor which is the most important factor in leading to a successful outcome. If you decide to continue after the first session, we will agree to work together with clear aims in a warm, accepting and therapeutic environment. You share your thoughts and feelings with me and I will use my counselling skills to help. Counselling is not a quick fix. As a client you must be prepared to embark on a journey which will involve increasing self awareness and may be uncomfortable at times. I will be with you the whole time, supporting you with empathy and understanding. Counselling ultimately offers you the chance to feel free. It can increase your wellbeing and overall life satisfaction. ...or anywhere in UK over Skype or by telephone.